There are many articles out there about self-care, and they all have a different spin. Some talk about bath bombs and muffins. Others talk about medical appointments and paying the bills. I thought I would try my hand at writing one that suits my personality—so here is my guide to geeky self-care. I’ll tell you what works for me, and maybe some if it will translate into something you can use for yourself. A little about me. I have anxiety and depression with a splash of obsessive-compulsive disorder. Sometimes I just have these things; sometimes I suffer from them. The methods below are how I gain relief in times of trouble. Find something you can immerse yourself in when the world gets too scary or the thoughts get too dark. And I do mean immerse yourself—it doesn’t have to be forever, but when your palms get sweaty and your breath catches in your throat, it’s time to take a break. My fandom is Tolkien. Anything written by, written about, parodied of. The one good thing about obsessive-compulsive disorder is that it gives you a mind for details, so I know this world inside and out. So much so that all I must do is close my eyes and I can visualize scenes from the books or movies. I can recite passages verbatim. It is a way to escape. Connect with other geeks who support your hobbies. People to come over at a moment’s notice to play Magic: The Gathering when you don’t feel like being alone. Or if not Magic, then some other game that requires intense concentration. Why intense concentration, you ask? Because that way you are only focusing on one thing, and your thoughts don’t have time to spiral out of control. Have friends who know how to speak to you during an anxiety attack. One time when I was freaking out, one of my friends asked, “What would Legolas do?” And I kid you not, it worked. 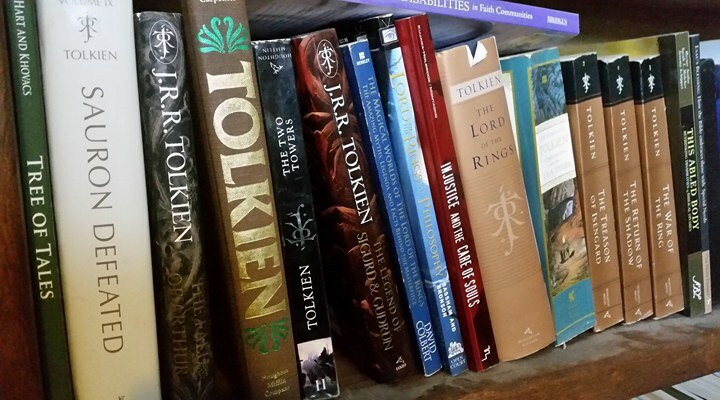 Tolkien books—about a third of my collection. If you’re like me, you’ll have to give yourself a time or chapter limit or you’ll never put it down. Of course, being a Tolkien geek, my choice is The Hobbit or The Lord of the Rings, but pick whatever your favorite book is. Curl up in an armchair and have something to drink. (I like coffee.) Turn the page and begin. I like Supernatural and Firefly. Again, I have watched them so many times that I can quote along with the show, and the characters feel like friends. Everyone has different tastes, though. Watch a cooking show if that is your thing—whatever you geek out about, be it angels and demons or pies and cupcakes. Watch a couple of episodes. If you feel adventurous, try something new. Try a show you have on your Netflix queue that you just haven’t gotten to yet. Sherlock is a good one, as each episode is an hour and a half. Whether it is deep breathing or yoga, it doesn’t matter what activity, just add your own flair. I color. 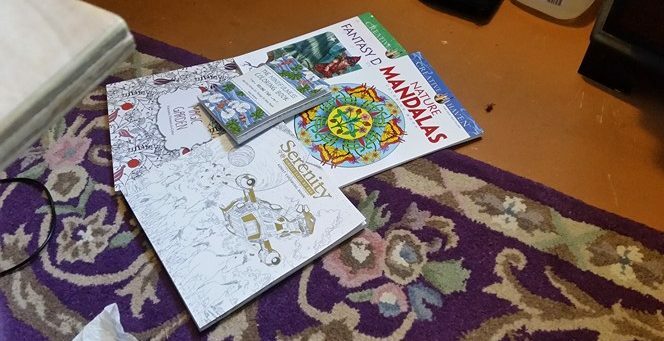 I will admit to having more coloring books than I need, from Tolkien-inspired designs (surprise, surprise) to Firefly to fairies. I have them all. There are different ways to color; I like to put on soft music in the background—old-school country is my favorite—but some people like silence. It doesn’t matter which way you choose because when you focus on the lines and the shading, your brain, instead of being so busy with activity, starts to quiet. Part of my coloring collection. When I can’t sleep at night, I pick a playlist and hit go. Sometimes I just play the same song or band over and over. (“I Shall Not Walk Alone” by the Blind Boys of Alabama really soothes my anxious soul.) But you need to find the song that speaks to you. Do something anything that brings joy to your heart and that you do well. Some people make pottery. Some people sing Karaoke. I write short stories and poetry. I create my own worlds and I pour my feelings out on paper as a means of release. Finally, and most importantly: seek help if you need it. Don’t be afraid or ashamed. Reach out. What are some ways you use your geekdom in your self-care? Great tips! I have often turned to crafts – stitch after stitch of crochet or the exact placement of decoupage can be meditative, yet distracting, because like you said, it requires concentration.